Start writing shorter and less bug-prone Python code. 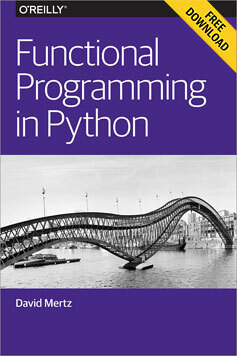 Download Functional Programming in Python. It is hard to get a consistent opinion on just what functional programming is, even from functional programmers themselves. A story about elephants and blind men seems apropos here. Usually we can contrast functional programming with “imperative programming” (what you do in languages like C, Pascal, C++, Java, Perl, Awk, TCL, and most others, at least for the most part). Functional programming is not object-oriented programming (OOP), although some languages are both. And it is not Logic Programming (e.g., Prolog). Functions are first class (objects). That is, everything you can do with “data” can be done with functions themselves (such as passing a function to another function). Moreover, much functional programming utilizes “higher order” functions (in other words, functions that operate on functions that operate on functions). Functional languages eschew side effects. This excludes the almost ubiquitous pattern in imperative languages of assigning first one, then another value to the same variable to track the program state. In functional programming we focus not on constructing a data collection but rather on describing “what” that data collection consists of. When one simply thinks, “Here’s some data, what do I need to do with it?” rather than the mechanism of constructing the data, more direct reasoning is often possible. Functional programming often makes for more rapidly developed, shorter, and less bug-prone code. Moreover, high theorists of computer science, logic, and math find it a lot easier to prove formal properties of functional languages and programs than of imperative languages and programs. Two approaches to testing lambdafied code. Over the past 18 months or so I’ve been talking to a lot of people about lambda expressions in Java 8. This isn’t that unusual when you’ve written a book on Java 8 and also run a training course on the topic! One of the questions I often get asked by people is how do lambda expressions alter how they test code? It’s an increasingly pertinent question in a world where more and more people have some kind of automated unit or regression test suite that runs over their project and when many people do Test Driven Development. Let’s explore some of the problems you may encounter when testing code that uses lambdas and streams and how to solve them. Usually, when writing a unit test you call a method in your test code that gets called in your application. Given some inputs and possibly test doubles, you call these methods to test a certain behavior happening and then specify the changes you expect to result from this behavior. Lambda expressions pose a slightly different challenge when unit testing code. Because they don’t have a name, it’s impossible to directly call them in your test code. You could choose to copy the body of the lambda expression into your test and then test that copy, but this approach has the unfortunate side effect of not actually testing the behavior of your implementation. If you change the implementation code, your test will still pass even though the implementation is performing a different task. Java 8 is here, and, with it, come lambdas. Although long overdue, lambdas are a remarkable new feature that could make us rethink our programming styles and strategies. In particular, they offer exciting new possibilities for functional programming. All of the code examples mentioned in this post can be found in this github repo. Lambdas are succinctly expressed single method classes that represent behavior. They can either be assigned to a variable or passed around to other methods just like we pass data as arguments. You’d think we’d need a new function type to represent this sort of expression. Instead, Java designers cleverly used existing interfaces with one single abstract method as the lambda’s type. Before we go into detail, let’s look at a few examples. Have a look at them once again until you familiarize yourself with the syntax. It may seem a bit strange at first. We will discuss the syntax in the next section. You might wonder what the type is for these expressions. The type of any lambda is a functional interface, which we discuss below. Functional programming avoids side effects (also known as state or mutable data) by using functions that operate on other functions. It emphasizes expressions over commands, and computation over assignment. There are lots of functional languages, including Lisp (the original) and XSLT (the one I happen to know best). Being a polyglot programmer has its benefits; most of us have read or heard about those benefits from various respectable sources. I’d like to highlight the importance of being a polyglot learner before being a polyglot programmer. Most programmers currently code in one of the mainstream languages like Java, C#, and C++. On a typical enterprise project, chances are we’re using one of these languages. It might seem like a tall order for most of us to be able to intermix other languages. However, it’s becoming more critical that we do. Let’s discuss why. A language built to support event handling, not strictly a functional programming language but fitting that mold. A deep understanding of markup structures. A home in the browser. Thursday afternoon at Balisage, O’Neil Delpratt and Michael Kay discussed Interactive XSLT [2.0] in the browser, showing not just the usual transformations but a working engine for a graphical interface. Their earlier XML Prague paper also tells the story and shows more code detail, including a chess game. Can We Do Better Than XML and JSON? Today’s Balisage conference got off to a great start. After years of discussing the pros and cons of XML, HTML, JSON, SGML, and more, it was great to see Michael Kay (creator of the SAXON processor for XSLT and XQuery) take a fresh look at what a markup language should be.